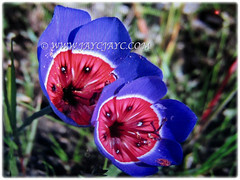 Botanical Name: Papaver somniferum (syn. : Papaver laciniatum). 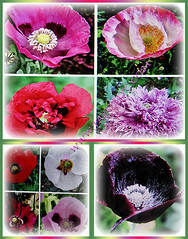 Common Names: Opium Poppy, Bread Poppy, Common Poppy, Fringed Poppy. Etymology: The genus name, Papaver from Latin means poppy. The species epithet somniferum is Latin for sleep bringing, refers to the narcotic properties of the plant. Origin: Native to eastern Mediterranean, southeastern Europe and western Asia. 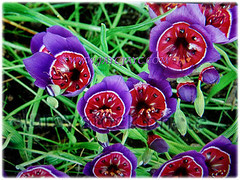 It is cultivated elsewhere around the globe..
Plant type: An annual and herbaceous plant. Features: Papaver somniferum is from the genus, Papaver that comprises of 64 accepted species. It is a fast-growing and upright annual herb growing to about 1 m tall. The plant is strongly glaucous, giving a greyish-green appearance. Its stem and leaves are sparsely covered with coarse hairs. 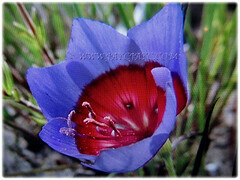 It produces large, serrated and deeply lobed bluish-green leaves, 7.6-15.2 cm long and clasp the stem at the base. Its exceedingly beautiful flowers are up to 3-10 cm diameter, normally with four white, mauve or red petals, sometimes with dark markings at the base. 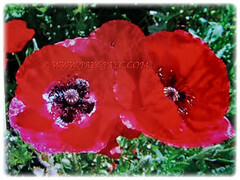 It is the species of plant from which opium and poppy are derived and is a valuable ornamental plant grown in gardens. This common annual can have flowers in many shades of pink, red, purple or mauve, white and bicolours.Single types have 5 luminous and papery petals while double types have many more. Singles or partly double forms form a cup shape with a dark or white blotch at the base. Flowers on large plants can be up to 10 cm across. Large bluish green seed pods follow the short-lived blooms. Fat and dull-green buds covered with soft hairs start out hanging from downward-nodding stems but become erect as the sepals open to reveal the tightly packed petals. The sepals typically fall off the plant but occasionally will remain attached at the base of the flower. The fruit is a hairless and rounded capsule topped with 12-18 radiating stigmatic rays or fluted cap. Culture (Care): Papaver somniferum or Opium Poppy grows easily with the least maintenance. Light: Full sun but will benefit from afternoon shade in the warmest regions. Moisture: Moderate water needs. Water regularly during growth. Soil: Any moderately well-drained soils. Others: Although poppy seeds are edible, they do contain trace amounts of alkaloids that may cause drug tests to show positive for opiates. Take note that all other parts of this pretty poppy are toxic, thus do not ingest. Generally free from serious garden pests. However, do watch out for ?. 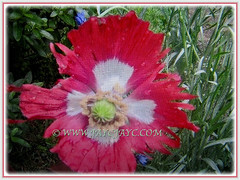 Papaver somniferum or Opium Poppy are hardy and cool season annuals, germinating early in the season. Its foliage is not affected by light frosts though the flowers are sensitive to freezing. Opium poppy is an annual that can tolerate frost as a seedling. The dull green to blue-green, glaucous leaves clasp the strong upright stems growing from a stout tap root. The smooth leaves have jagged edges and a crisp texture, resembling loose-leaf lettuce leaves. The foliage begins to decline once the plant is in bloom and by the time the flowers are done will dry up completely. Blooming in early- to mid-summer. Sow seeds in early spring a few weeks before the last expected frost. Propagation: Easily propagated from seeds. They self-seed readily and are pollinated by bees. Usage: The flowers of Papaver somniferum or Opium Poppy can be used as cut flowers, lasting longer if the cut stem is cauterized before placing in water. 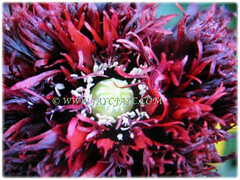 Raw opium is derived from the milky sap that exudes from the green seed capsules when they are cut. The capsules turn brown when they ripen, and the dry seed is used for breads and other baked goods. The curious looking seed capsules are good in dried arrangements, too. This poppy is grown as an agricultural crop on a large scale for one of three primary purposes. The first is to produce seeds that are eaten by humans, known commonly as poppy seed. The second is to produce opium for use mainly by the pharmaceutical industry. The third is to produce other alkaloids, mainly thebaine and oripavine that are processed by the pharmaceutical industry into drugs such as codeine and morphine. Poppy seeds from Papaver somniferum are an important food item and the source of poppyseed oil, an edible oil that has many uses. Both the oil and the seed residue also have commercial uses. Poppy seeds are used as a food in many cultures. They may be used whole by bakers to decorate their products or milled and mixed with sugar as a sweet filling. Its seeds can be dry roasted and ground to be used for treating asthma, stomach illnesses and bad eyesight. The oil can be pressed for oil for cooking or for use in oil-based paints. Poppies are usually used as bedding flowers. The strikingly beautiful flowers of the opium poppy are at their best in mixed borders and beds. The capsules turn brown when they ripen and the dry seed is used for breads and other baked goods. 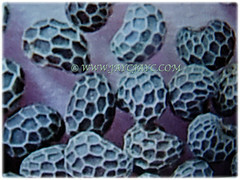 Besides, the curious looking seed capsules are good in dried arrangements.